The death of Nathan Bates Chamberlin occurred at his home on North Walnut, Sunday night at 8 o''clock. The funeral was held Wednesday at 2 o''clock at the Congregational Church, Dr. M. M. Culpepper, officiating. Burial was made here. While Mr. Chamberlin had been ill for several months, probably a year, he had worked until about two months ago, at his trade, with S. E. Wilkinson, the, plumber and tinner. Since that time he has been confined to his bed much of the time, and on Wednesday, following a bad spell, he lost consciousness, which he never regained. 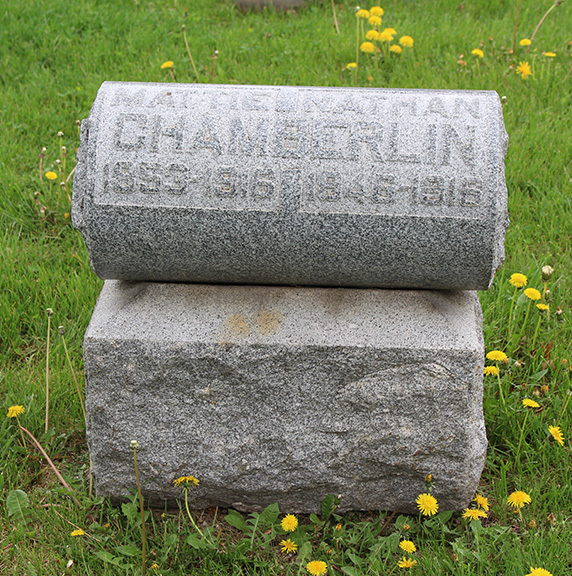 Mr. Chamberlin was born in Connecticut, Connecticut, April 1, 1846, and was consequently, 70 years, 7 months and 25 days of age. He had lived in Olathe so long he was regarded as a pioneer resident. For many years, in fact, ever since a young man, he had been a member of the Methodist Church, and he lived true to its teachings. He had been a member of the Odd Fellows lodge but did not belong at the time of his death. His wife died four months ago, but he is survived by the following children of the twelve who were born: Guy, of California, Claude of Washington, Marvin, Bertha and Euna, of Olathe. Mr.Chamberlin was held in high regard by all his associates and acquaintances. His good traits were many and his faults not many if any at all. Please share your memories of Nathan Bates.